Elland suffered a third successive defeat in Division One of the National Conference League when they were beaten 34-24 by Normanton Knights at Greetland yesterday. A string of injuries has suddenly made life hard for Karl Fairbank’s side, who had won their opener at Shaw Cross Sharks following promotion. 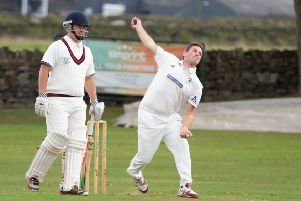 Elland were always playing catch-up in blustery conditions. Their handling was below par and the dismissal of giant forward Cayci Pearson eventually ended their hopes. Playing with the wind, Normanton got off to a good start with a converted try after 10 minutes after selling the home defence a dummy. Knights quickly doubled their tally, good passing through the backs creating an overlap for the winger to score in the corner. Elland were really up against it when the winger scored again, although the conversion was missed. The home side finally got on the scoreboard when Joe Fradgley burst through, Pearson converting to make it 6-16. Normanton’s young winger scored again but Chris Dyson collected his own kick to score and Pearson converted. Almost immediately a Normanton penalty made it 12–22 at half time. Elland started the second half in a better style and Jack Fairbank kicked through on the fifth play and dropped on the ball to score. Pearson’s kick closed the gap to four points but Knights’ fifth try and the dismissal of Pearson for a dangerous tackle left Elland up against it. The 12-man hosts responded with a try from James Marshall and Brad Radcliffe converted but Normanton were relentless and made the game safe with two unconverted tries. Ben Bottomley was man of the match for Elland, who host sixth-placed Salford City Roosters next Saturday.